detail from Bosch's 'Death of the Miser' in the Nat. Gal. Washington DC. I've seen this work before in the flesh, but hadn't studied it long enough to notice the pencil marks outlining unpainted forms on the shelf depicting part of the miser's material wealth. The rest of the painting has many initial sketchmarks, showing a longer arrow as held by death, the volumous toning for the curtains and some minor compositional changes. 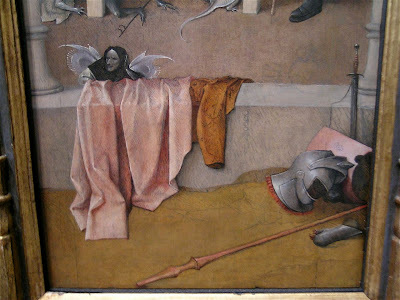 I haven't read much about the 'plastic' aspects of the painting, but it's quite odd to see so much sketching and thin paint layers remaining on a 'finished' Bosch painting, especially in comparison to his impasto paintwork on the works I've seen in the Prado. Anyway, what was interesting was that I started noticing pencil marks in a few other paintings, most noticeable in Raphael's small Cowper Madonna, where he's redrawn the position of the shoulder and veil.